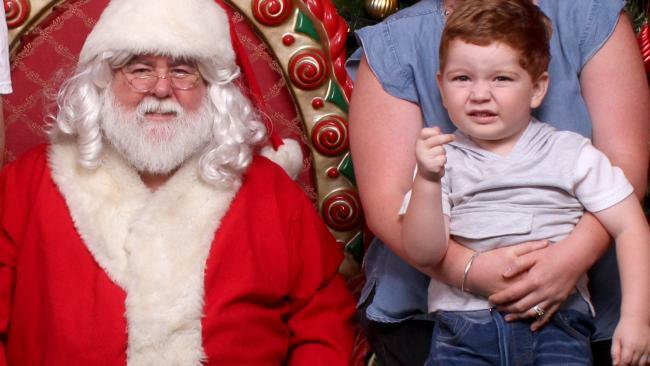 A MUM was left red-faced after paying $35 for photos of her shy son meeting Santa - only to later discover the tot had flipped his middle finger at the camera. Embarrassed mum-of-two Tammie Hopley, 29, only realised cheeky Ryder's adorable protest when she showed the professional photographs to a friend. 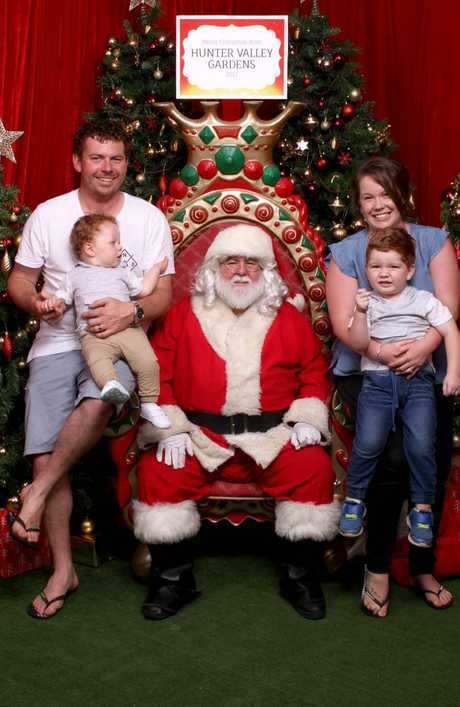 The hilarious images show a squirming Ryder, two, raising his middle finger at the camera while sat next to Santa with dad Matthew Hopley, 30 and brother Ledger, 10 months. Senior dental assistant and receptionist Ms Hopley said: "This was Ryder's third year going to meet Santa, and the first year he wasn't screaming and crying. "The previous years he was so scared. Last year he was crying so much we had to get a photo with Santa hiding behind us so he didn't realise he was there. "This year was the first time he was happy to see Santa. The photographer was asking us to smile and do different faces, we had lots of different photos taken. "In total I bought about 17 different photos. They were emailed to me for me to print for about $35. "It wasn't until the next day when I was uploading the photos and a friend was looking at them, that she noticed Ryder was sticking his middle finger up. "Until she said it, I hadn't spotted it at all and didn't notice he was doing anything out of the ordinary - I just thought it was a nice photo of us all. "What's so funny is Ryder is not the type of kid to do that. He's such a shy little boy so it just came out of nowhere. He's not the type of child to go out of his way to talk to anyone or cause trouble. "It took everything he had and everyone convincing him just for him to even say two words to Santa." 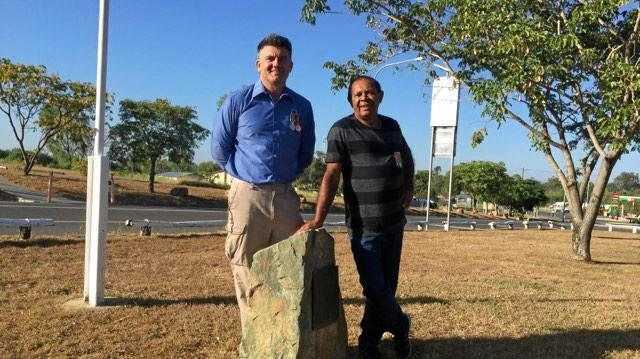 The photo was taken last Wednesday at the Hunter Valley Gardens Christmas lights display near Tammie's home in Cessnock, west of Newcastle. She and Matthew, a fire technician, now plan to hang the offending image in pride of place in their home and said it is much better than your average family photo. Tammie said: "We still really don't know whether or not it was intentional - I haven't asked him. His facial expression certainly makes it look intentional. "Everyone we have shown has found it absolutely hilarious. It is really funny and everyone's had such a good reaction to it. "I prefer this one out of all the pictures we got now. I'd rather have this one hung on the wall than a normal one. "In all honesty, I don't think he knows what it means but the timing is just absolutely perfect. 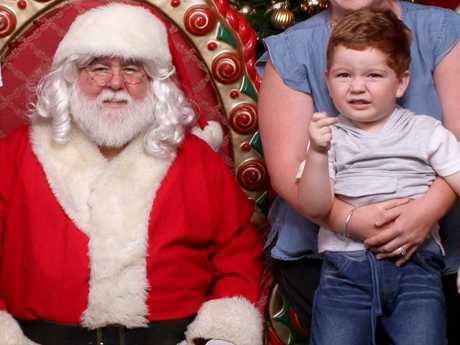 His brother is crying at the time in the picture as well because he was scared of Santa. "It's such a nice little keepsake - and definitely something to embarrass him with when he's older!"